Kristin Lewis is not only the Founder and Board President of the Kristin Lewis Foundation, but she is also a world-renowned opera singer, who continues to travel around the world. Ms. Lewis credits a lot of her travel to performing the title role in the opera Aïda, one of Giuseppe Verdi’s most beloved operas.Ms. Lewis is jet setting this summer in Verona, Italy. Let’s get the scoop on what she has been up to! Amerie: It’s been really hard trying to pin you down to get this interview done. You must be really busy. How’s Italy? Kristin: Yes, I’ve been extremely busy, balancing performance life with foundation work. It’s all very exciting! Italy…well what can I say? The country – its culture, history, food and people – is beautiful. It is also very hot here…very similar to…Arkansas’ summer heat! (giggle) Interestingly, the people of Verona, similar to Arkansans, seem to take it all in stride and do what’s needed to get through the summer heat. Amerie: Well, I pray to get through the heat in Arkansas. Kristin: (laugh) Prayer is always good. And air conditioning is one of God’s special gifts to the world. Amerie: (giggle) True. True. So, what’s going on in Verona, Italy these days that have you so busy? Kristin: I am performing in the Arena di Verona Opera Festival. One of the interesting literary points about this city is that it is the setting of two Shakespeare plays. One of these plays, in particular, is the familiar and tragic love story of Romeo and Juliet. Legend says that the feud between the families of these star-crossed lovers, the Capulets and Montagues, is based upon an actual rivalry between the Capuleti and Montecchi families of Verona in the 14th century. Both family homes still exist in the center of the city. It is plausible that there could have actually been a love story amidst the conflict of these families. I’ve visited Juliet’s house several times over the years. My first impression was one of slight disappointment because the house was not reminiscent of what has been presented in Hollywood movies. For example, Juliet’s home, depicted in films like “Shakespeare in Love” and television series like Shonda Rhymes’ “Still Star-Crossed,” illustrate the Capulet’s home as a grand palace. The actual home is far less ostentatious; yet, one can instantly feel the romanticism and mystery that linger when viewing it. Amerie: OK, now that you’ve given us some historical trivia about Verona, tell us more about the Summer Opera Festival in which you’re performing. Kristin: Well, before I do that, I have to tell you a little history about the actual structure where the Festival performances will take place. First of all it is a distinct privilege to perform in an outdoor arena that was built in 30 AD and originally seated 30,000 people. The arena was devastated by an earthquake in 1117, which destroyed its outer limestone facade; yet, the inner structure is still sound to this day. The Arena di Verona, which now comfortably seats 22,000, is the third largest existing arena in Italy, following Rome and Capua. Amerie: eah, how interesting! You’re right. While you were talking, I just looked up the seating capacity of Verizon Arena here in Little Rock. The seating there is just 18,000. Kristin: The Arena di Verona is a huge tourist attraction, as is the Arena in Rome. The difference is that the one in Verona is still functional. 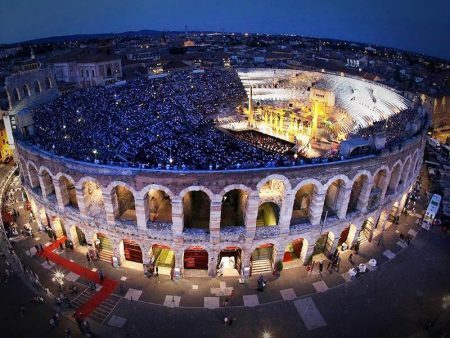 Because the seating of the Arena here in Verona is made of marble, it creates the most amazing acoustics! One does not need a microphone when singing on the enormous stage! It’s similar to the feeling of singing in your bathroom, only better! The voice never gets lost. The natural amplification is nearly perfect. Amerie: Yes! They came to watch Spartacus and the gods of the Arena! I wonder if Spartacus really looked like Andy Whitfield? Amerie: Man, what a way to be a Debbie Downer…. Kristin: I wasn’t trying to be, but this part of Italian history is sad. Because it was illegal to practice Christianity until the 4th century AD, so many Christians were persecuted in arenas and in other ways as well, of course. Fortunately Constantine eventually made Christianity the official religion of the Roman Empire. Before then, there was very little respect for Christians…. Amerie: No love for Christians, Kris? Not a smidge? Kristin: (giggle) Nothing… Nada… But now the Arena is the home of a magnificent opera festival. 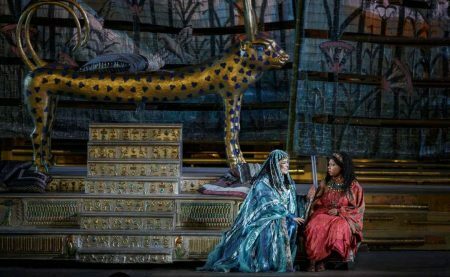 It began in 1913, and the first opera produced was Aïda as a way of celebrating the centennial birth of the composer, Verdi. The festival subsequently grew each year, and is now a world famous tourist attraction. Amerie: So how long is the festival? Kristin: It began at the end of June and will end at the beginning of September. During this period, five different operatic productions and two concerts will be performed. Amerie: So it’s safe to say that we are all excited that you’re performing Aïda at this year’s festival! I noticed on the Arena‘s webpage that the season will be opened with Bizet‘s Carmen, then followed by Aïda. Kristin: Correct. The other productions being presented are The Barber of Seville, Turandot and Nabucco. Amerie: So is this your first time participating in the festival at the Arena di Verona? Kristin: No. This is the second time I’ve had the privilege to perform in this festival. The first time was relatively early in my career. I have come to realize that the difference between the first time I performed here and this time is that I am approaching my performances with an inner security that I didn’t have before. In a way it affirms for me that I’m truly at home in this role. The authenticity needed to capture the essence of Aïda never waivers; therefore, the bar is constantly being set very high for sopranos attempting this role. 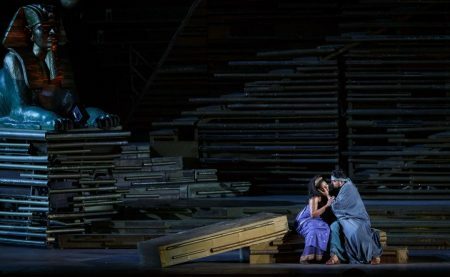 In this production the conductor, Maestro Jordi Bernàcer, is fantastic! He seems to truly understand how to bring out the beauty of every phrase. He equally understands the necessity of allowing singers the time to breathe calmly, which aids significantly toward our ability to sing beautiful phrases. Amerie: OMG! Aida starts and ends the festival this year! From the description of the festival on its homepage, it truly is a spectacle… but not in a bad way…. Kristin: I understand what you meant…. Yes, it’s truly a marvel and “must see” for any traveler in or around Italy during the summer months. The set was designed by one of the best in the world, Franco Zeffirelli! The costumes and back drops are also very beautiful. Amerie: So what’s the difference between doing the production in an indoor, smaller venue versus an outdoor, larger one? Kristin: The most obvious difference is being at the mercy of the weather. One must acclimate and be flexible in dealing with the heat, rain and wind. Moreover, in theatres, a character’s movements onstage can be more intricate because the audience can see everything happening more clearly. However, in an outdoor arena like this one, detailed movements can get lost. Therefore, this means that the performers’ gestures must be made in a more grandiose fashion. Amerie: I feel you…. So, Ms. Lewis, what are your final words for us? Amerie: Thank you, Ms. Lewis. There you have it folks! Kristin is doing really great things in Verona, Italy! We’re so proud of you! Kristin: (giggle) Thank you. The pleasure is mine.